Grilled peaches have finally made their way to my table and I just have to say, we waited far too long. I had no idea what I was missing. They tasted like the peaches in my favorite peach cobbler, but without any of the effort or extra ingredients. Take the peaches and slice them in half. Preheat the grill. Place peaches face-down on the grill on low heat for 10 minutes. When they are tender, they are done. For a real treat, serve these whole or sliced alongside Homemade Vanilla Ice Cream. Mary, I forgot I have peaches in my fridge. Thanks for the reminder. Going to make this for tonight's dessert! This looks so delicious! Unfortunately, I have no access to fresh peaches :( Wonder if I can grill canned ones? Or maybe I can substitute with pineapples. 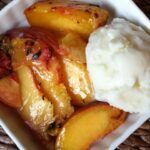 I love the sound of grilled peaches - something I've never tried before! I'm just waiting until good local peaches show up in our neck of the woods. Grace - I wouldn't try canned peaches, however Grilled Pineapple is fantastic. Definitely try it if you have a chance. Oh this looks so delicious! 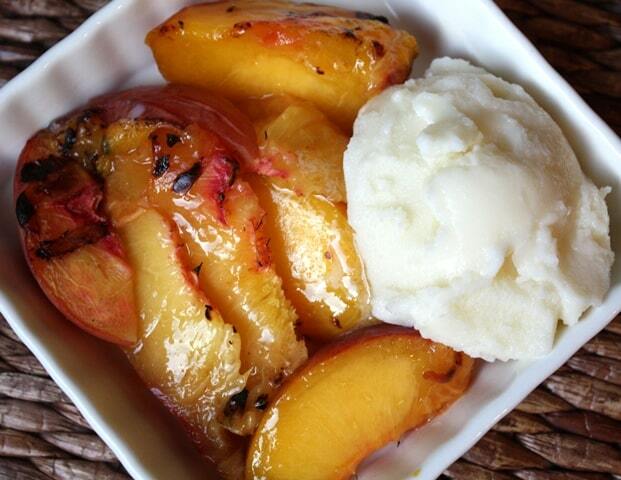 I've never grilled peaches, so I think I'm going to have to try this! How delicious looking! You have so many delicious looking recipes, but this one particularly catches my eye. Thanks so much for your sweet comment on my blog about healthier eatting. I'm following you now :) Hope you have a good weekend! I don't think that would work. Canned peaches are so much softer than fresh. I can't imagine how they would work on the grill without just falling apart, even in a grill basket. If you decide to try it, let me know how it works for you!